Don’t leave trash, food scraps or other litter on beaches and don’t throw it into the water. Please gather your litter in bags then dispose of it properly in trash bins. 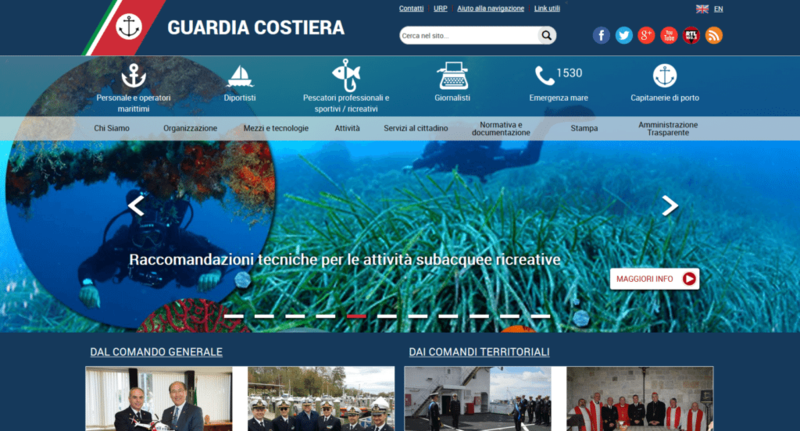 To celebrate the Italian Guardia Costiera’s 150th anniversary, there will be a new website: www.guardiacostiera.it. The site has been completely updated and the new, user-friendly format is easy to use across platforms like Android and iOS and from smartphones or tablets. New content includes info on the respectful use of the marine environment and safety both on and near the at sea. The website is available to all be they recreational boaters, fishermen, sailors and even the simply curious. The new homepage has a scrolling news ticker with the latest updates on Guardia Costiera activities. At the center of the page you’ll find info from the Central and Local Headquarters and updates on their activities. There are also video and photo galleries that explain the role and the history of Italy’s Capitanerie di Porto. Visitors to the new website will find it includes “mini sites” run by local maritime offices also included on the main site with updates on warnings, orders, exams, forms and other notices updated in real time.